Like many other technologies driving the digital transformation of businesses, the concept of hyperconverged infrastructure, or HCI, has evolved over the years. What started off as an IT appliance combining software-defined storage and compute resources has expanded in recent years to include software-defined networking, hybrid cloud footprint, and cloud-native application support. In 2019, expect to see an even greater expansion of HCI use cases spill over into high performance applications that have been traditionally served by legacy storage systems. The operational savings of modern HCI environment will also drive cloud-native use cases that bridge on-premises environments with the cloud. Here are three trends around HCI to watch for in 2019. Remember when Gmail introduced the 1GB mailbox? Every IT manager does because that was the first day that the cloud operational model became the de facto standard for corporate IT. Every IT director had to defend why their expensive corporate email system could not match the flexibility of the public cloud. The same dynamic is underway today for modern infrastructure. Users who have experienced the speed and flexibility of the public cloud are relentless in demanding the same agility from their expensive corporate IT. HCI unleashes flexible, software-defined infrastructure that meets the fast-paced change of today's applications owners at a fraction of the cost of expensive, proprietary storage systems. The new HCI operational model puts corporate IT back on offense so that users can spend time on new applications and eliminate the tedious provisioning of siloed legacy architectures. It is this cloud operational model that every IT manager needs to deliver in order to be relevant in a world of compressed budgets, fast-changing applications, and limited access to skilled staff. Public cloud has indisputably changed the world of IT forever. But modern data centers are not going away, and only HCI offers a common operational model for both on-premises IT directors and cloud-native managers. HCI fully unleashes the potential of the public cloud by providing bi-directional mobility of applications and data protected by an application-centric security model. This shift not only allows new use cases - such as Disaster Recovery as a Service (DRaaS) - to emerge, but also breaks down IT silos between traditional cloud and cloud-native applications and use cases. What we will see is that hybrid cloud, defined as integrated public and private clouds, becomes the new normal where success for IT will depend on selecting HCI software architectures that provide a full stack common operational model bridging these two worlds. One of the more nuanced developments that the new year will bring is the rise of IT operations that will span from physical infrastructure management to application clusters while also incorporating support for orchestrated Kubernetes. At the heart of it is the single platform that allows companies to leverage their older applications and introduce new cloud-based ones to handle both traditional and next-generation workloads. Through application-centric management, HCI extends the vision of autonomous IT in a number of ways that go beyond an offering of a single platform with a full software stack for compute, storage and network capabilities. Beyond that, it opens new doors, such as enabling support for Kubernetes or integrating unified data protection solutions. HCI has already proven to be a disruptor to traditional IT with storage and compute integration leading the charge. The unstoppable cloud operating model available across the hybrid cloud will continue to bring value to IT managers as the evolution of HCI extends to more use cases where speed and agility matter. Choose your full-stack HCI solutions wisely to bring a cloud operating model to your business. HCI infrastructure that spans the private and public clouds with intelligent autonomous infrastructure will allow you to convert IT from a cost center to a competitive weapon. Lee Caswell leads a team driving storage that speeds the customer adoption of new products, partnerships, and integrations. Lee joined VMware in 2016 and has extensive experience in executive leadership within the storage, flash and virtualization markets. Lee has a long history of promoting flash adoption as vice president of Marketing at NetApp and vice president of Solution Marketing at Fusion-IO (now SanDisk). 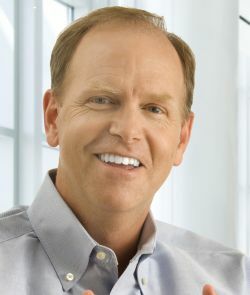 Prior to Fusion-IO Lee was a founding member of Pivot3, a company widely considered to be the founder of hyper-converged systems, where he served as the CEO and CMO. Earlier in his career, Lee held marketing leadership positions at Adaptec, and SEEQ Technology, a pioneer in non-volatile memory. He started his career at General Electric in Corporate Consulting.